Mother Nature is participating in Halloween this year, and it’s arriving with a dousing of rain. Not cool. Thursday: Showery and mild. An unsettled transitional period will make for a mostly grey day with temperatures in the mid to upper 60s. Friday: Oh boy, here it comes. The wind and rain will start picking up in the morning, before subsiding slightly during the afternoon. The models then show the moisture and rainfall ramping up and hitting it’s crescendo late in the evening. It’s going to be POURING in the Cascade and Olympic mountains where flooding of some streams and rivers may become an issue. 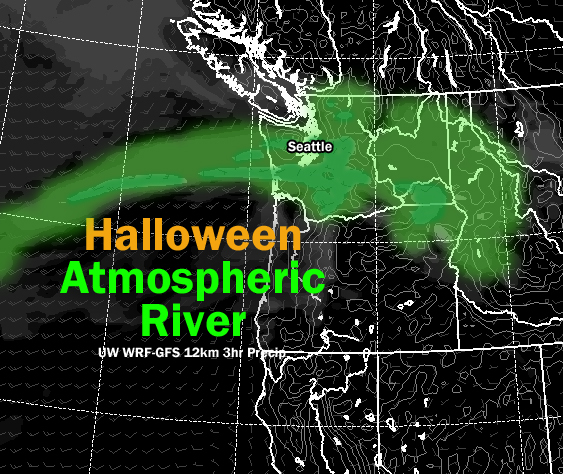 Halloween: After a night of dousing rain, you’re going to wake up to…more rain?! This relentless river of thick moisture suspended in the atmosphere is going to continue to drench the Northwest through Saturday morning until the atmospheric river slides southward and impacts Oregon and northern California. At this point, it looks like night-time Halloween festivities will only have to deal with occasional showers rather than the persistent downpour predicted for Friday. Sunday: Showers will be prevalent yet again as the upper level system churns south and destabilizes the atmosphere. Sunday will also bring the mountains their first chance of good snowfall. Keep in mind that forecasts can shift quickly in the short-term, so stay tuned. I will have more details as the weekend nears.